Building good credit and establishing an excellent credit score takes time. Yes, it can take years to establish good credit and only days to destroy or ruin your credit. Which is why after all the hard work and time you put into building and establishing your good credit, protecting your credit is critical. 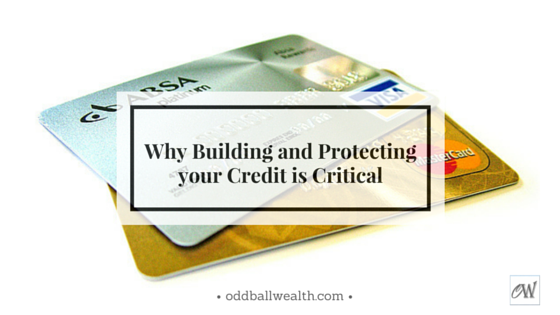 You’re able to build good credit over time by consistently paying any debt (loans, credit cards, mortgage, etc.) and other bills on time. By developing a satisfactory credit history, over time you’ll be considered a preferred and trustworthy borrower. Lenders will be more than willing to lend you money with below-average interest rates, saving you massive amounts of money. By having better-than-average credit and a strong credit score, receiving a loan(s) and / or other lines of credit becomes effortless. Another benefit to building good credit is you’ll be able to receive the lowest interest-rates possible on the money you borrow, even paying no interest (0% APR) at all for the first year or two. I currently have two credit cards that I carry balances on, simply because I don’t pay any interest on the balances those cards carry. One of my credit cards is interest free for the first 21 months and the other one is interest free for the first 18 months. The second credit card earns cash back on every purchase made using it, and earns cash back every time I make a repayment. Promotional 0% interest credit card offers are generally only offered and available to consumers who have established an excellent credit history and a preferred credit scores. Borrowing money and paying zero interest is like receiving free money! I’m able to put my everyday expenses on these credit cards and since they don’t charge me any interest, I only make the minimum payments every month. By putting all my expenses on my zero percent interest credit cards and only paying the minimum payment on the balances each month, I have more money to save and invest. In other words, I have more money available that I can put to work to make more money (using money to make money). They’re a countless benefits to having good credit! Building and establishing superior credit requires hard work and years of having a positive and timely repayment history, but it takes almost no time at all to destroy or permanently damage your credit. The best way to avoid anything from harming your credit is by taking precautions and protecting your credit. Late payments and/or missing payments completely on credit cards and other loan balances can have a negative impact on your credit report and credit score. Generally, if in the past you’ve had a good repayment history and have always made on-time payments, only missing a payment or two will have very little, if any, effect on your credit report and score. In most cases, your credit rating and credit score take the biggest hits when you haven’t done anything wrong. The most common way for your credit to be ruined or destroyed is from identity theft. Identity theft has always been a problem and since the creation of the internet, it’s become a very big and very common problem. It’s never been easier to steal a person’s financial account information and identity than it is today. The internet makes it very easy to steal valuable personal information and hack into data servers. Also, viruses, malware, and spyware can infect your computer and steal your information without you even knowing it. Once hackers have you personal information they can open lines of credit and take out loans in your name. Most people don’t realize their personal information has been stolen until it’s too late and your credit is ruined beyond repair. When you finally do realize someone else has been using your credit and taking out personal loans and credit cards in your name, the damage to your credit has already done and is sometimes beyond repair. At this point, you have thousands of dollars’ worth of outstanding debt that was taken out by somebody other than you. The debt has compounded significantly from months or even years of accumulated interest and late payment fees. As an added consequence you’re credit score is ruined and considered an “irresponsible and untrustworthy borrower” on your credit report. You will no longer be able to borrow money or take out credit. You’ll receive “loan default” letters and legal notices from debt collectors threatening of legal action if you don’t repay the outstanding debt. It’s a living nightmare that happens to millions of consumers every year. It’s a mess that can take many years to try and fix. After you’ve been a victim of identity theft the process to attempt and undo the damage is very stressful, time consuming, and an expensive legal process to fix. Even after you hire expert advisers and get a lawyer to help fix the issue, much of the damage done is irreversible and can never be completely fixed. If your personal information is every stolen it’s important to catch it early. Catching suspicious activity early on and when it first happens, makes fixing the issue much easier and less complex than if months or years went by before catching credit fraud or identity theft. The only way to catch credit fraud early is by monitoring your credit reports and credit activity regularly. By monitoring your credit reports on a regular basis you’re be able to catch any suspicious activity on your credit report and fix it. To access and monitor your credit reports and credit score, use reliable and trustworthy sources like myFICO. They’re the leading experts for providing actual credit reports, scores and information to consumers online. When viewing your credit reports, look for suspicious activity and red flags such as mysterious transactions made on a credit card, any new line(s) of credit that have been opened in your name, or even a new car purchased on credit in your name. These would all be obvious red flags, some red flags are more obvious than others. Examples of obvious red flags and credit fraud could be thousands of dollars’ worth of random purchases of woman’s clothing made on a male’s credit card who lives five states away and has no past history of purchasing woman’s clothing. Another obvious red flag example might be a new car purchased on a line of credit in your name, and you clearly don’t have a new car. You can fully protect yourself from credit fraud and identity theft by having all your personal and financial accounts, credit reports and credit score, computer, other data professionally monitored 24/7 and alerting you immediately of any suspicious activity. Two highly recommended companies the offer consumers 24-hour/ 7-days a week full service monitoring and protection against credit fraud and identity theft are IdentityForce and Identity Guard. Avoid going to suspicious and untrustworthy websites. Be cautious as to what you download from the internet. Don’t fall prey to phone and email scams that ask for personal information, like bank account numbers and credit card numbers. Check your credit report and credit score regularly from trust worthy sources like myFICO. Never carry your Social Security Card in your wallet in case your wallet gets stolen or lost. Avoid directly using your credit card number or bank account and routing numbers when making online purchases. Instead use a secure third party to make the transaction for like PayPal. Scan your computer regularly for viruses and malware using a trusted and reliable virus scanner. Fully protect yourself against credit fraud and identity theft using IdentityForce or Identity Guard. Within the credit idsnutry it is considered a bad idea to grant credit to someone already experiencing re-payment issues. Consider power-paying. You can look up this idea through your favorite search engine. Succinctly, start paying double payments on the lowest monthly responsibility on one of your open accounts until that payment is zero. then, apply all of that money to the next one and so on. more credit will not help you at this point until you get a handle on this you will always be feeling that you are sinking in debt. Many people can pull themselves out of debt in 18 to 24 months but you have to get started. All my best to you. Understanding your credit score and how to protect it is crucial. Yes, you need to regularly check your credit report to ensure there are on errors and that you have not been the victim of identity theft. James recently posted…Where Are You In Your Financial Lifecycle?